Explore Rajasthan in depth on this amazing holiday to India – visiting Golden Triangle and a Tiger reserve, as well as the pink city of Jaipur, Jaisalmer deep in the Thar Desert (where you can ride a camel at sunset), Jodhpur & the beautiful lake city of Udiapur with its many palaces. Also visit the Tal Mahal in Agra. English speaking guides, all transfers, jeep safaris & excursions included. A full day on the road today as we drive for 6-hours to Bikaner, travelling through the deserts of Rajasthan - "the Land of Kings". Along the way we stop to visit the Deshnok Temple famous for its rats, which are treated as sacred and given protection here. This 600-year old temple, with its huge intricately carved silver gates, is dedicated to Karni Mata. Continue to Bikaner, tucked away in the desert and characterised by its beautiful sandstone architecture. In the late afternoon we visit a Camel Farm. This morning we visit the impressive Junagarh Fort, built by Raja Rai Singh in the 16th century on the desert plain, but many palaces were added over the next three centuries. The outer wall, built of light red sandstone, is surrounded by a moat and within are beautifully designed palaces with balconies, kiosks and fine jali (lattice work) screens with richly decorated interiors. The Badal Mahal (Palace of Clouds) inside the fort has walls covered with stories from the life of Lord Krishna, whilst the walls of the oldest palace, the Lal Niwas, are elaborately decorated in red and gold. After our visit we travel 6-hours to the golden city of Jaisalmer and enjoy the scenery of the Great Thar Desert with its vast expanses of sand dunes and thorny shrubs. Here you will see Rajasthani women dressed in colorful skirts, veils and heavy silver jewellery balancing a number of pots on their heads, as they march in a group to the nearest water-head, while men in turbans lead their camels. We check into our hotel in Jaisalmer. Named after its founder, the Rajput king Maharawal Jaisal Singh, this fortified hilltop town stands on a ridge of yellow sandstone, crowned by its fort. Many of the houses are finely sculptured and the fort contains the palace and several ornate Jain temples. This morning we expore Jaisalmer, a city untouched by time and a major staging post on the trade route across the forbidding Thar Desert. We visit commanding Jaisalmer Fort, called the "Golden Fort" because of its honey-coloured sandstone walls that rise out of the hot barren desert. The fort encloses elaborately carved 12th to 16th century Jain temples and several palaces decorated with delicate jali (lattice work) screens, flora carvings and carved doors. The narrow streets of the fort and the city are lined with exquisite havelis (private mansions). Similar in style to the homes of Venetian merchants, these were the mansions of wealthy traders. Each haveli has an inner courtyard, surrounded by richly decorated apartments with beautifully carved facades, screens and windows. Three of the most famous are Nathmalji-ki-Haveli, with its beautiful arched roof with carved peacock brackets; Patwon-ki-Haveli with its elaborate latticed façade and Salim Singh-ki-Haveli. Outside the walls of the fortified town is the small oasis of Gadi Sagar, which led Prince Jaisal to found his city. It is well worth visiting to see the large number of shrines around it and the migratory birds, which it attracts. You can also visit the markets of Jaisalmer with their handicrafts, tie and dye products and camel leather footwear. In the late afternoon a special treat awaits - a Camel Ride into the sand dunes at sunset. Today we leave Jaisalmer and travel 6-hours to the historic city of Jodhpur, the second largest in Rajasthan and known as the 'Blue City' because of its many blue-painted houses. This old walled and gated city encircles Mehrangarh (Majestic) Fort, with the modern city sprawling outside its walls. On arrival we visit this 15th century impregnable fort towering above its 6-mile (10-km) wall, with soaring archways and many beautiful palaces, each decorated with exquisite engravings, lattice and mirror work. It has a museum with an unusual collection of miniature paintings, glided palanquins and a solid silver howdah presented by a Mughal emperor to the Maharaja. We also visit Jaswant Thada - a cluster of royal cenotaphs in white marble built in memory of Maharaja Jaswant Singh II. We finish with a visit to the Clock Tower and Sardar spice market. Today we drive 6-hours from Jodhpur through the mountains to beautiful Udaipur. Along the way we view the vast and impregnable 15th century Mewar fortress at Kumbalgarh. Built by Rana Kumbha, this was the birthplace of Maharana Pratap, the great king and warrior of Mewar. A UNESCO World Heritage Site, these great walls extend over 24 miles (38 km) and are second only in length to the Great Wall of China. They are wide enough to take eight horsemen riding abreast and the fort offers a superb bird's eye view over the surrounding countryside. We also stop at Ranakpur to visit its famous Jain Temple. Constructed of light coloured marble, this grand temple has very distinctive domes, shikhara, turrets and cupolas that rise majestically from the hill. Over 1,444 marble pillars support the temple, each one carved in exquisite detail and no two are the same. It is said that it is impossible to count the pillars. There is one beautiful carving made out of a single rock of marble, with 108 heads of snakes and numerous tails where you cannot find their end. Continue to Udaipur and check into your hotel in this serene city of lakes. Today enjoy a half tour of the highlights of Udaipur, the former capital of the kingdom of Mewar that offers history and culture, as well as some lovely scenery. 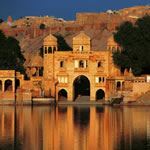 It is famous for its many Rajput palaces, such as the Lake Palace that covers an entire island and is now a luxury hotel. We visit the City Palace, the focal point of the city with several areas of interest such as the Suraj Gokhada balcony, Badi Mahal garden palace, Sheesh Mahal palace, Mor Chowk (peacock courtyard) and Zenana Mahal (queen's palace). The Crystal Gallery at Fateh Prakash palace has possibly the largest collection of crystal in the world including objects d’art, furniture, washing bowls and even a crystal bed. Next we visit the Jagdish Temple, with its imposing sculpted figures and heavily ornamented interiors and Sahelion-ki-Bari Gardens, constructed for 48 maids who accompanied the wife of Maharaja Sangram Singh II as dowry. Afternoon is at leisure to relax at your hotel or enjoy some shopping. Alternatively you can visit the temples at Nagda, Eklingji and Nathdwara. Nagda has an ancient Mewar palace dating back to the 6th century and its Sas-Bahu temples are exquisitely carved. Eklingji was built of sandstone and marble and its 108 temples are enclosed by high walls, with a roof comprised of hundreds of knobs. Nathdwara is an important Hindu pilgrimage centre that is famous for nurturing intricate Pichwai paintings that portray Lord Krishna. In the evening enjoy a boat ride on Lake Pichola (subject to water levels). Transfer to Udaipur Airport for your flight to Mumbai, where you will be met and transferred to your hotel situated near the airport.